Sunrooms by American Sunspace, Inc.
American Sunspace is a locally owned company that started doing business in 1976. Our sunroom manufacturing facility is located on 125,000 square feet in Elkhart, Indiana. 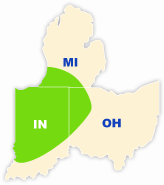 We serve the Indiana, Michigan and Ohio areas (see map). All installation of our sunrooms are done by American Sunspace employees, no-sub contractors. Everything we offer is literally "Factory Direct." American Sunspace offers 3 Season and 4 Season Sunrooms, replacement windows and doors at the highest quality and largest variety in the area. Because we are factory direct your costs are 5% to 20% less than our competitors therefore, our customer base is over 17,000 satisfied customers. Our design consultants come into your home to listen to your ideas and make suggestions to design the best 3 and 4 Season Sunrooms, Replacement Windows and Doors to fit your home, lifestyle and budget. American Sunspace offers the most exterior color in the industry to make your sunroom match your home regardless of it's architectural style and color. An American Sunspace increases your homes value, marketability and living space, bringing fresh air and tranquility of the outdoors into your life to make you feel healthier and happier for years to come. What better way to enjoy your home than in your very own American Sunspace Sunroom? Thank you for you interest in our company. To receive your free in home 3 Season or 4 Season Sunroom and Replacement Window and Door Design estimate contact us or call us at 1-800-772-4626! I just wanted to send a note to tell you how much I love my new enclosure and deck! - Deb N.